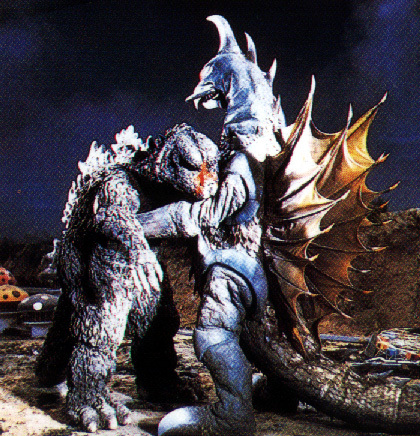 As I said in my “Godzilla vs. Megalon” review, “Godzilla vs. Gigan” and that movie are so intertwined that it is almost impossible for me to separate them. Mostly because both of these movies are products of their time. 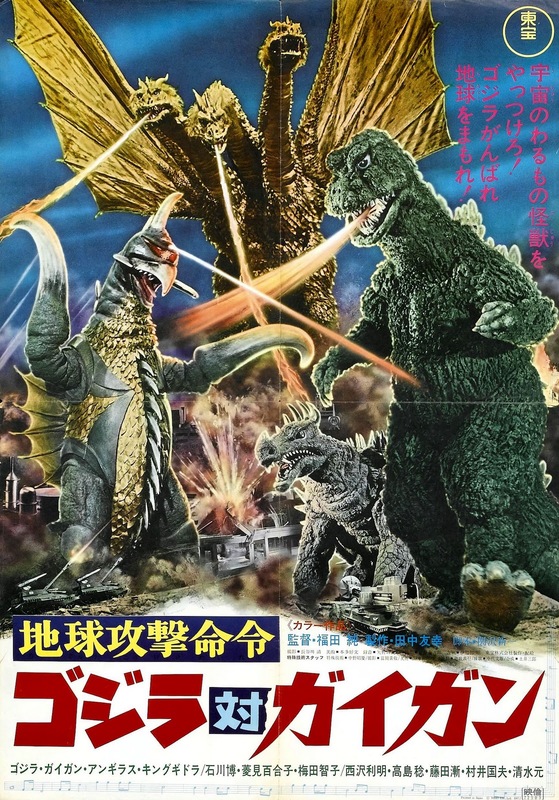 In the 1970s, the daikaiju boom of the 1960s had lost its luster and monster movies in Japan were seen more as children’s films than ones for adults. 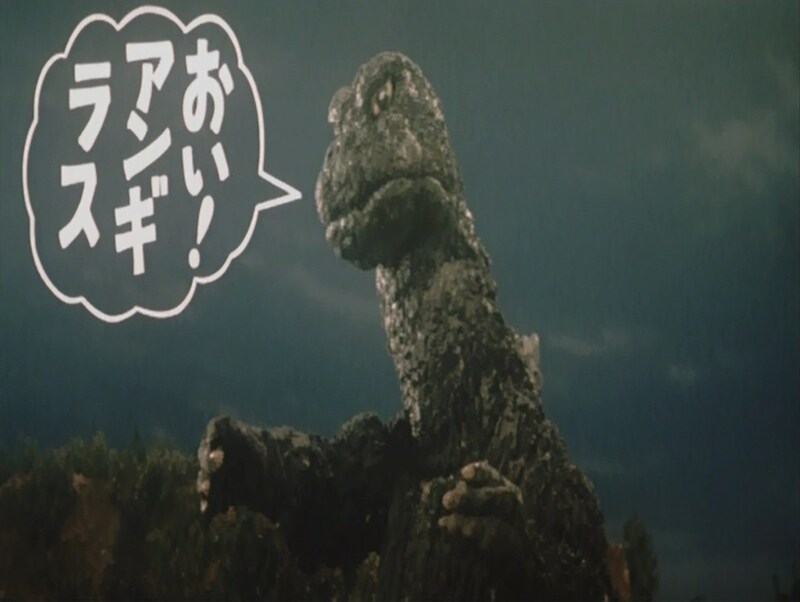 This certainly was not helped by Daiei making cheesy and campy Gamera movies that were always aimed at little kids, and the Godzilla movies started doing more comedic scenes with implausible plots, even for monster movies. Both “Godzilla vs. Megalon” and “Godzilla vs. Gigan” are the height of that campy, cheesy era, while also keeping their budgets low and relying probably far too much on stock footage. So not only were these movies made for kids, but they were often lazy too. The reason I put “Godzilla vs. Gigan” ahead of “Megalon” is because it feels like there was more effort put into the movie. Not much more effort, but enough to notice that there are some good monster scenes to be found here, even if you have to wait some time to get to them. 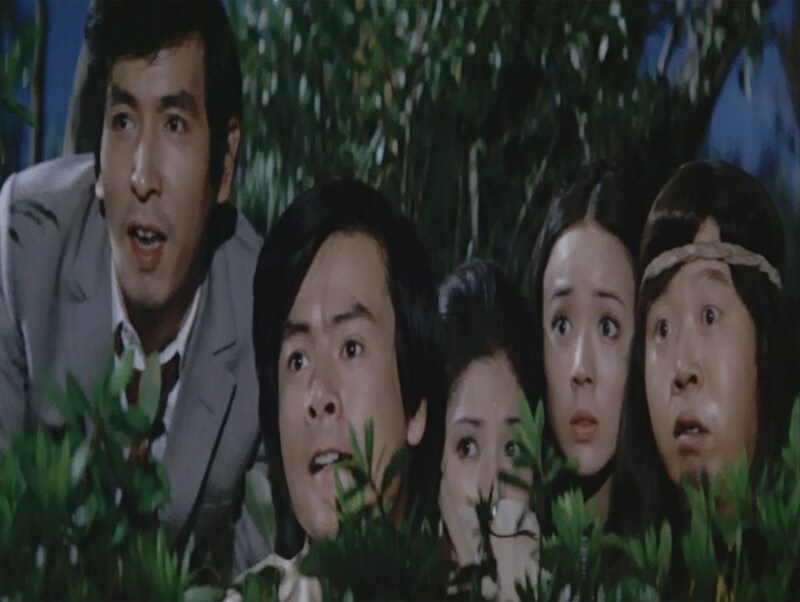 In a way, “Gigan” feels like more of what we got in the 1960s with Godzilla, with its sense of atmosphere, monster battles and music, while still going heavy on the 1970s acid and counter culture antics. Our movie begins with a comic book writer, Gengo Kotaka (Hiroshi Ishikawa), trying to sell his ideas for monsters to his publisher, in particular monsters centered around homework and strict mothers. His publisher thinks his ideas are terrible, even though they are what he asked for when he wanted something far away from the kaiju on Monster Island. Gengo starts looking for inspiration and goes to a newly built area of Japan known as World Children’s Land, with it’s main attraction being a Godzilla tower that is just as tall as the real Godzilla. While Gento is there, he bumps into a young lady who drops a weird tape. He quickly finds out this girl is being chased by the head of security Kubota (Toshiaka Nishizawa), who says that Gento shouldn’t worry about what she was up to. Gento secretly holds onto the tape as he meets with the chairman of the World Children’s Land, Fumio Sudo (Zan Fujita), a young prodigy who is far too busy with astrological calculations to pay much attention to Gento, outside of saying he wants to bring about peace to the entire world. Eventually, we find out exactly what the chairman means by “peace,” and that is the age-old villain perspective of bringing about peace by wiping out all of humanity. In this case, the chairman needs that tape to broadcast a signal into outer space that would put the monsters Gigan and King Ghidorah under his control. He would then use his two monsters to destroy all human life and anything that stands in his way. Oh, and it turns out the chairman and Kubota are aliens from the Space Hunter Nebula M galaxy – giant cockroaches disguised as humans. We’ll ignore the obvious logical hole of a tapes’ signal reaching beyond the vacuum of space and simply ask why these aliens went to all the trouble of building a land for children and proclaiming peace when all they ever wanted was to wipe us out. Wouldn’t it just be easier to take the tapes, summon King Ghidorah and Gigan and conquer the world? Why even give humans a chance to learn about your plans and stop you? These aliens have the same problem as the Futurians in “Godzilla vs. King Ghidorah” – they give our heroes an unreasonable number of opportunities to foil their plans. Gento eventually meets up with the girl who got her hands on the tape and her hippie boyfriend who threatens Gento with an ear of corn (though Gento believes it is a gun). They play one tape and it has a strange effect on the kaiju on Monster Island – they start talking. Yup, in the English version of this movie, we get to hear Godzilla and Anguirus have a full conversation about how something funny is going on. Personally, I would have liked to see them do an entire Quentin Tarantino-like exchange, maybe the opening scene from “Inglorious Basterds,” but this is still just as hilarious. In the Japanese version, Godzilla, and Anguirus have this conversation through word balloons, like a comic book, and it is just as silly. They only have two conversations in the movie, one about how Anguirus needs to go check out what’s going on, and another about how Anguirus needs to keep up if they want to save Tokyo from Gigan and King Ghidorah. Gigan’s design is one of the more unique kaiju out there. A chicken-looking monster with hooks for hands, one giant red eye shaped like a Cylon visor from “Battlestar Galatica,” with a buzz saw on his chest and huge oddly-shaped fins on his back. His design is certainly the most memorable thing about his character, because otherwise he comes across like a dummy who has no idea how his body even works. Once Gigan and King Ghidorah are introduced, they spend about twenty minutes destroying Tokyo together until Godzilla and Anguirus show up to engage in the titular monster battle. Most of the destruction scenes with these two monsters are comprised of stock footage from previous Godzilla movies, especially the shots with King Ghidorah, though it is set to Akira Ifukube’s amazing music. In fact, that’s another thing I should address – this film is not only made up of mostly stock footage, but also all stock music. Just about every piece of music used in “Godzilla vs. Gigan” was composed by Akira Ifukube, but was taken from about ten or twelve different movies that he worked on in the past. Honestly, I don’t mind this as much as the stock footage, because Ifukube’s music is used well here, adding more impact to many of the monster scenes that it would otherwise lack. I like to think of “Godzilla vs. Gigan” as a best-of compilation for Akira Ifukube’s music. Anyway, after another long swim, Godzilla and Anguirus arrive in the middle of Gigan and King Ghidorah’s attack on Tokyo, leading us into a battle that takes up the entire third act of the movie, like “Megalon” and “Godzilla vs. Space Godzilla.” But unlike those two films, “Gigan” has these four monsters battling all over the place, starting in the oil refinery district of Tokyo, before moving to a large grassy plain, and then to the World Children’s Land, where the Godzilla Tower gets in on the action and starts shooting the real Godzilla with its beam. One aspect I’ll give this film credit for is making it look like Godzilla’s having the toughest battle of his life (up to this point), as he gets smothered by King Ghidorah, blasted by Godzilla tower, is practically blind at one point in the fight, and Gigan becomes the first monster in the Showa series to make Godzilla bleed. This was not an easy fight for Godzilla and Anguirus, and it is only due to the interference of our main characters that Godzilla is victorious. Gento and his friends are able to infiltrate the Godzilla tower at one point and plant explosives in the elevator, causing the head to blow up and destroying the tapes that controlled Gigan and King Ghidorah. 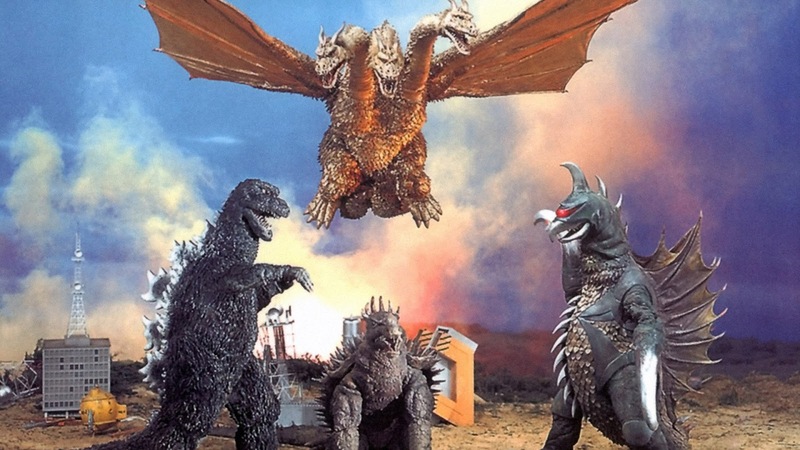 With the two being practically incapacitated, Godzilla and Anguirus take advantage of this and do some gravity defying stunts, as Godzilla tosses King Ghidorah around like a rag-doll and Anguirus slams into both monsters with his spikey back with the thrust power of a rocket. If there’s one part of this fight that I’m not a fan of it, it is the suits they choose for King Ghidorah and Godzilla. This Ghidorah, while not too different from the one that was around in the 1960s, looks much skinnier and doesn’t have as much detail on the heads and eyes, making it look like this Ghidorah went on a diet. While this Godzilla suit had been previously used in the last three Godzilla movies, the wear-and-tear on the suit is clearly visible. Near the end of the movie, you can practically see the suit falling apart. The bad monster suits bring me out of the fight nowadays, especially as the fight goes on and it relies less on stock footage and more on the crappy cheap suits. I would normally say the fight between the four monsters was the best part of the movie, but honestly the human characters are so energized and quirky that I liked most of their scenes better than many of the monster fights. Gento’s girlfriend was especially great, since she constantly used her martial arts skills to fight off the cockroaches henchmen and wasn’t afraid to call Gento out every once in a while. It felt like they played an active role in this attempt to save the planet, maybe even more so than Godzilla. Still, “Godzilla vs. Gigan” is not well-put together. It is cheap, from its monster suits to its use of stock footage, convoluted, and more than a little silly. But it never takes itself too seriously and always has an upbeat attitude thanks to its main cast of characters. The soundtrack all of Akira Ifukube’s greatest hits and is used wonderfully in this movie. I’m not entirely sure if I’d call this one “so bad, it’s good,” but it does blur the line between the two.